Bengal Gram and Oats are very beneficial for diabetes patients as they help in regulating blood glucose levels, blood pressure and cholesterol levels. Soak Bengal gram in water for 4-5 hours. Drain water and grind it in the mixture/food processor. Add water as per the need. When it is completely done, add oats and grind it again to mix it properly. Add green chillies, ginger-garlic paste and make thin batter. Take non-stick tawa/griddle, add 1-2 drops of oil. Cut 1 onion with skin into half, rub it on the tawa, add 2 ladles of batter and spread it evenly with a ladle to make thin dosa. 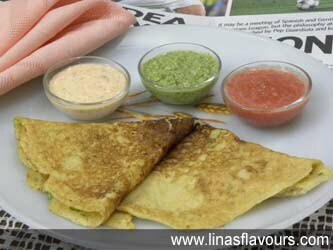 Onion helps the dosa to turn smoothly without sticking on the tawa. Cook it on one side and when it is almost crisp, turn on another side and cook it on medium flame. Fold it into half or four folds or roll it. Before second dosa, again rub onion with 1-2 drops of oil. Same way prepare all the dosas. Serve it hot with tomato, green chutney and garlic curd.